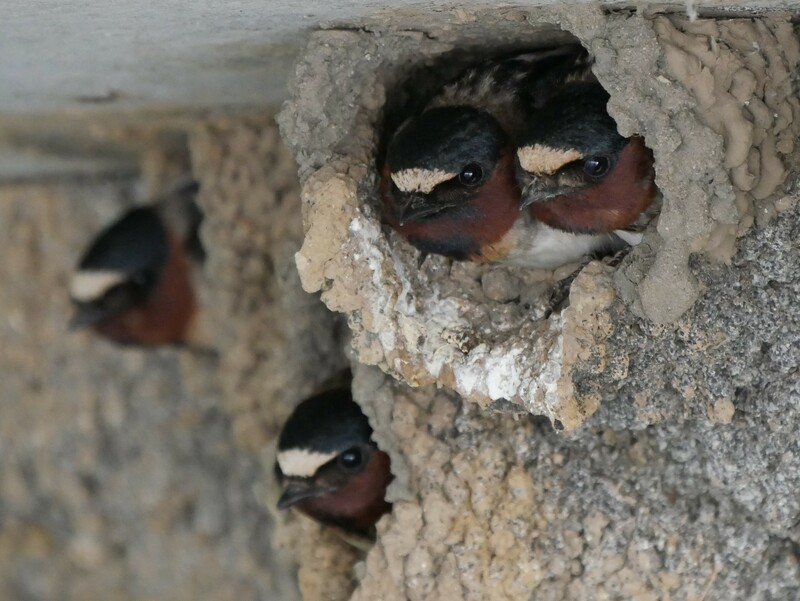 We often see Cliff Swallows when paddling central Ohio’s reservoirs. While seeing them is not rare, getting a good picture of one is. During a recent outing on Griggs Reservoir we had the opportunity to use the canoe to our advantage. 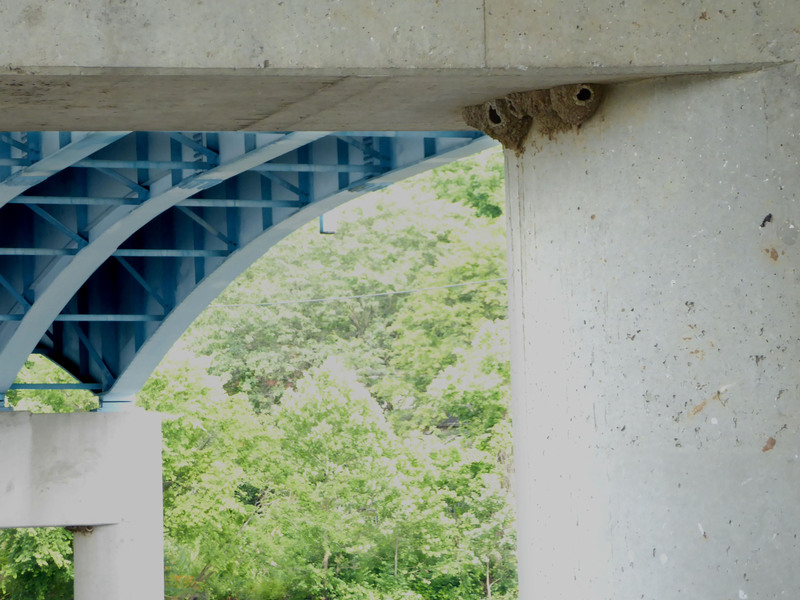 We positioned ourselves so that, sitting motionless, a light breeze propelled the canoe toward swallow nests located on the bridge support structure. By being very still we were able to get much closer than we had previously. Once the paddles were picked up to reposition the boat, the birds flew. Typical Cliff Swallow nest location, Griggs Reservoir, Panasonic ZS50. 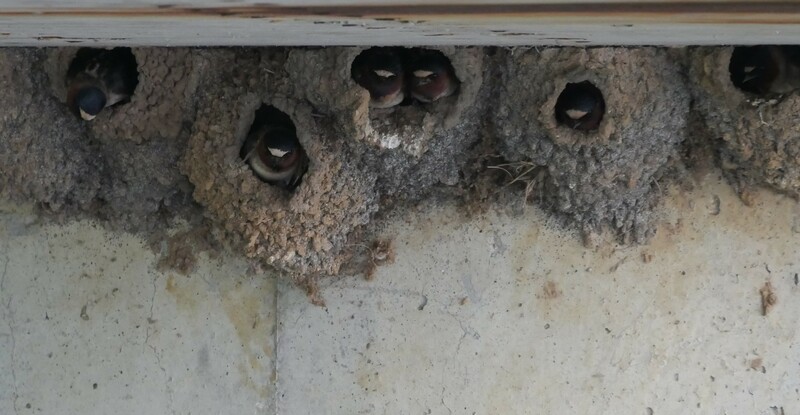 Cliff Swallows, Griggs Reservoir, Panasonic G7 Leica 100-400mm lens, cropped, (Donna). A closer look, Panasonic G7 Leica 100-400mm lens, cropped, (Donna). North end of Griggs Reservoir, Panasonic FZ200. 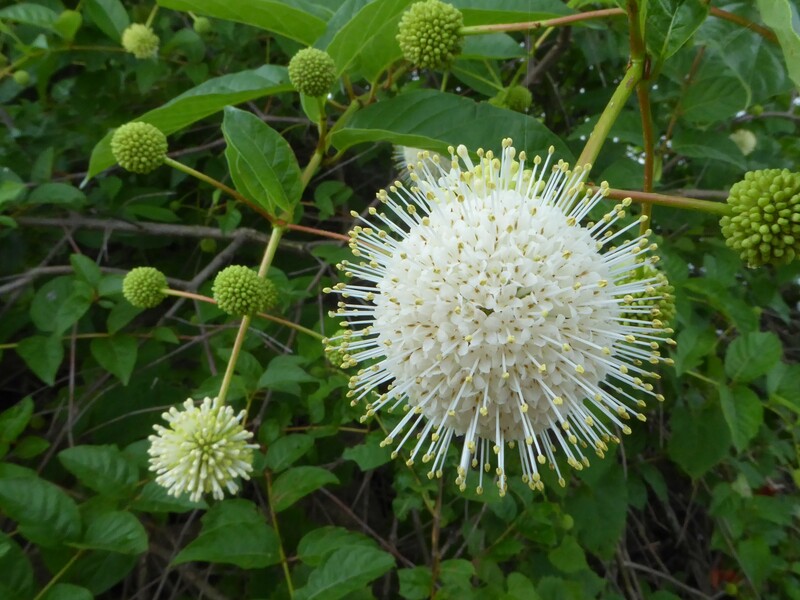 During our trip, which covered the length of the reservoir, there were plenty of things to see. This was a good thing because I was testing a new Sigma 18-300mm lens. The hope is that the lens, mounted on my DSLR, will do most of what my Panasonic FZ200 does, landscapes, close-ups of insects, and to some extent birds, but with more creative control and exposure latitude while still having the convenance of not having to switch lenses. In harsh light DSLR APS-C sensors tend to do better with highlights and shadows (exposure latitude) when compared to the much smaller sensor used in the FZ200. The Sigma lens is a story of compromises given that it goes from extreme wide angle to telephoto. It’s not a macro lens but will take reasonable pictures of “bugs” while at the same time doing a decent job with landscapes and birds that aren’t to far away. Overall I’m satisfied with it’s performance realizing it will never compete with fixed focal length lenses for ultimate sharpness. For those not familiar with sensor sizes see the chart below. I’ve also included the type of camera used for each picture should the reader be curious. 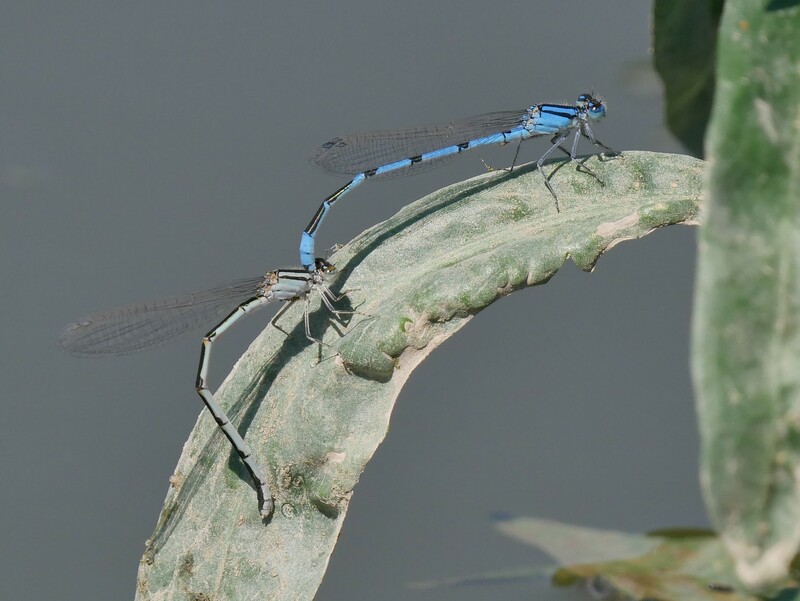 It’s the insect time of the year along the reservoir ensuring that there are plenty of fascinating subjects. Fragile Forktail, Griggs Reservoir, Canon 60D with Sigma 18-300mm lens, (cropped). 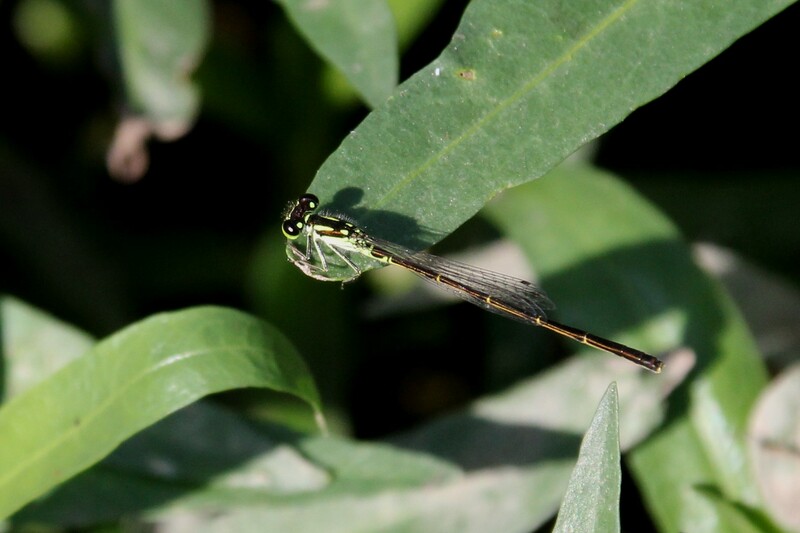 Eastern Forktail (F), Griggs Reservoir, Canon 60D with Sigma 18-300mm lens, (cropped). 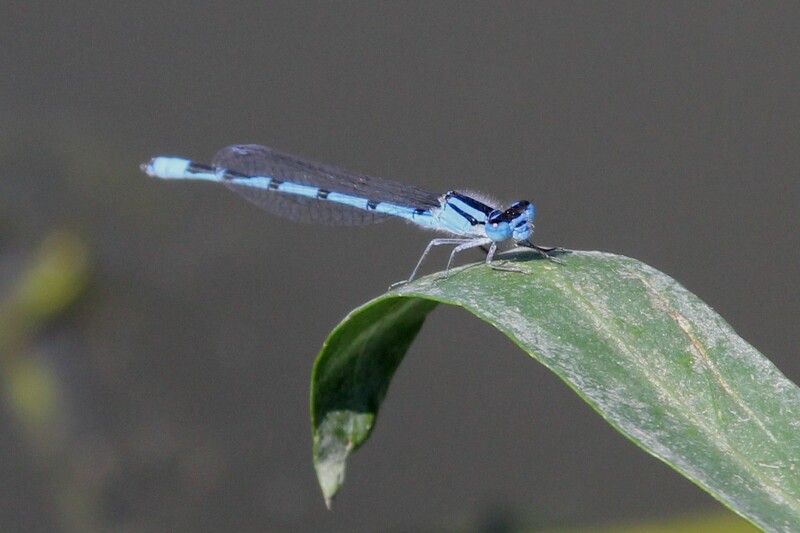 Familiar Bluet, Griggs Reservoir, Canon 60D with Sigma 18-300mm lens, (cropped). 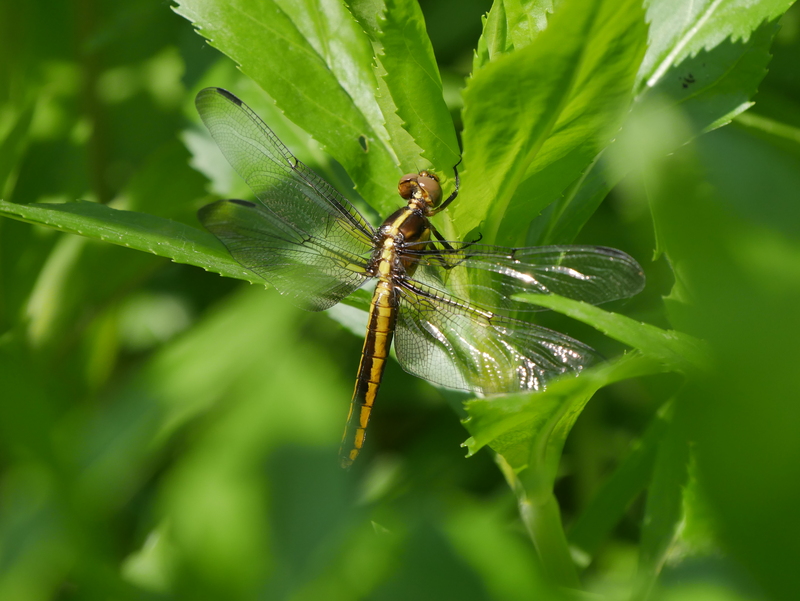 Widow Skimmer (F) not fully developed, Griggs Reservoir, Panasonic G7 Leica 100-400mm lens, (Donna). 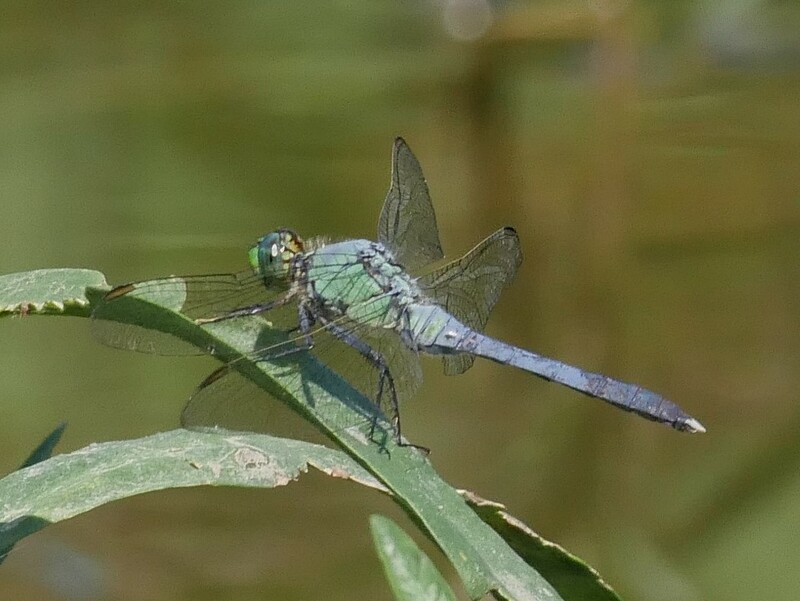 Eastern Pondhawk (M), Griggs Reservoir, Panasonic G7 Leica 100-400mm lens, cropped, (Donna). 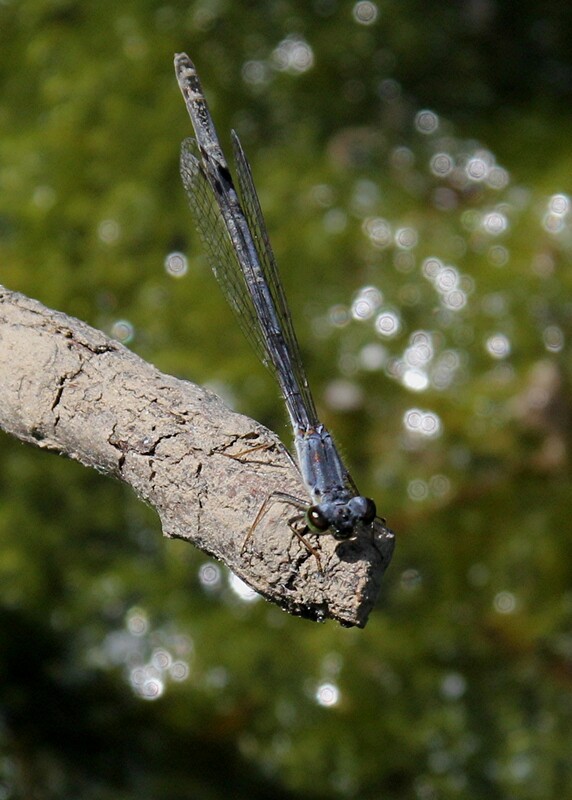 Familiar Bluet, Griggs Reservoir, Panasonic G7 Leica 100-400mm lens, cropped, (Donna). Bee on Milkweed flower, Griggs Park, Panasonic Zs50. 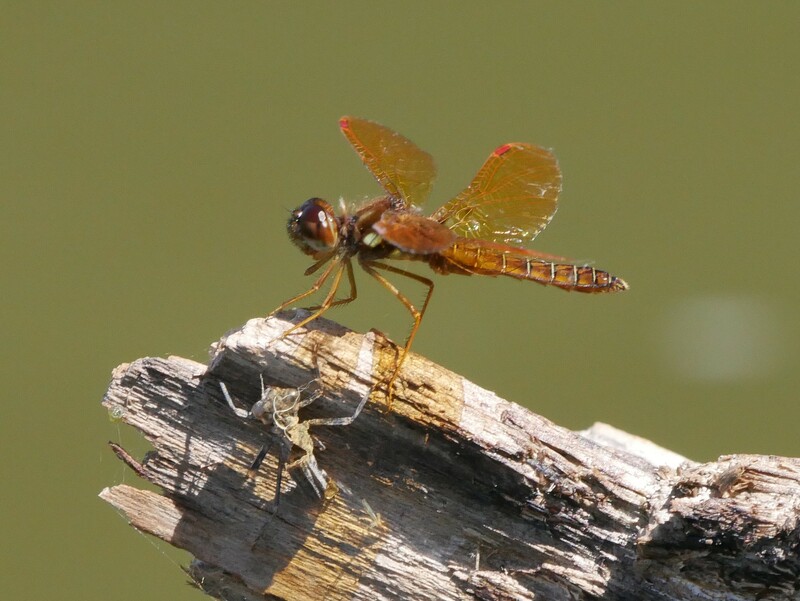 Eastern Amberwing, Griggs Reservoir, Panasonic G7 Leica 100-400mm lens, cropped, (Donna). Happy Milkweed Beetles, Griggs Reservoir Park, Panasonic ZS50. Reptiles and amphibian greeted us during our journey. 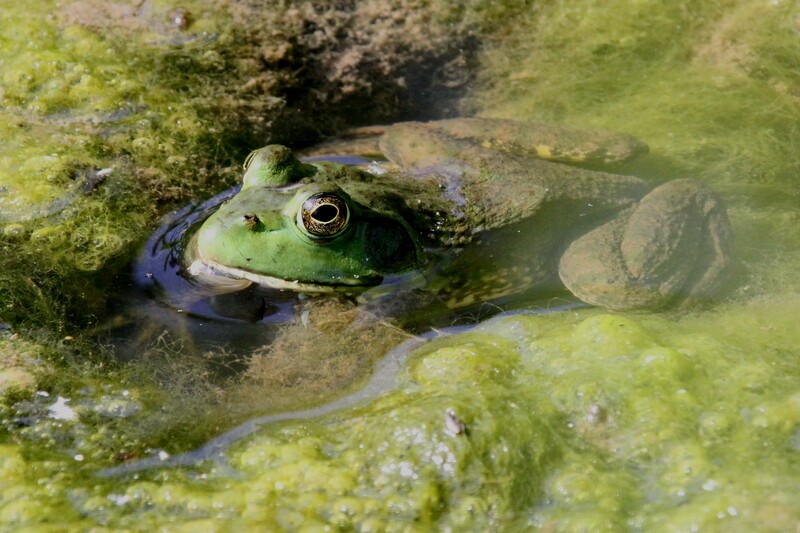 Bullfrog, Griggs Reservoir, Griggs Reservoir, Canon 60D with Sigma 18-300mm lens, (cropped). 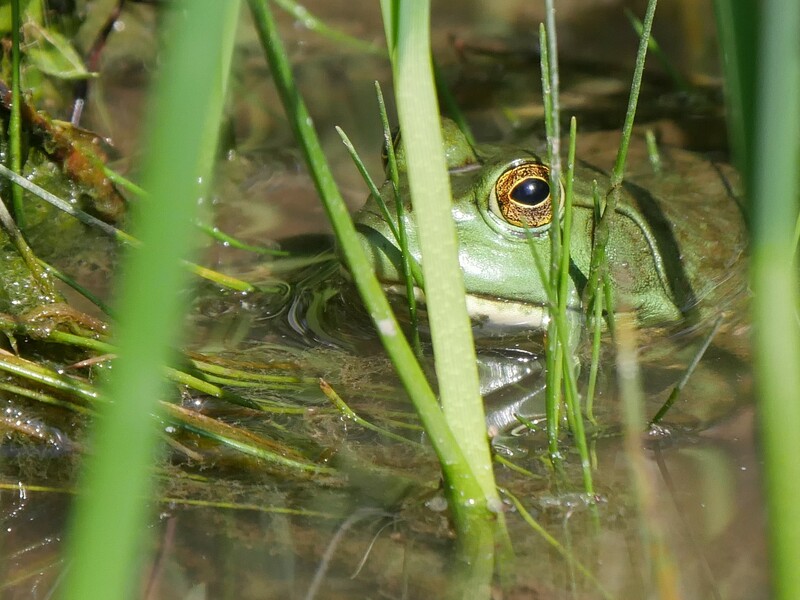 Hiding, Griggs Reservoir, Panasonic G7 Leica 100-400mm lens, cropped, (Donna). Very small Map Turtle, Griggs Reservoir, Panasonic G7 Leica 100-400mm lens, cropped, (Donna). Looking at the other side, Griggs Reservoir, Panasonic G7 Leica 100-400mm lens, cropped, (Donna). Other things also watched our passing. White-tailed deer along the shore of Griggs Reservoir, Panasonic G7 Leica 100-400mm lens, cropped, (Donna). At the very north end of the reservoir, Kiwanis Riverway Park, we pulled the boat out for a snack break and spent some time checking out the area birds. Hopefully a few more challenging subjects for the Sigma lens would be found. 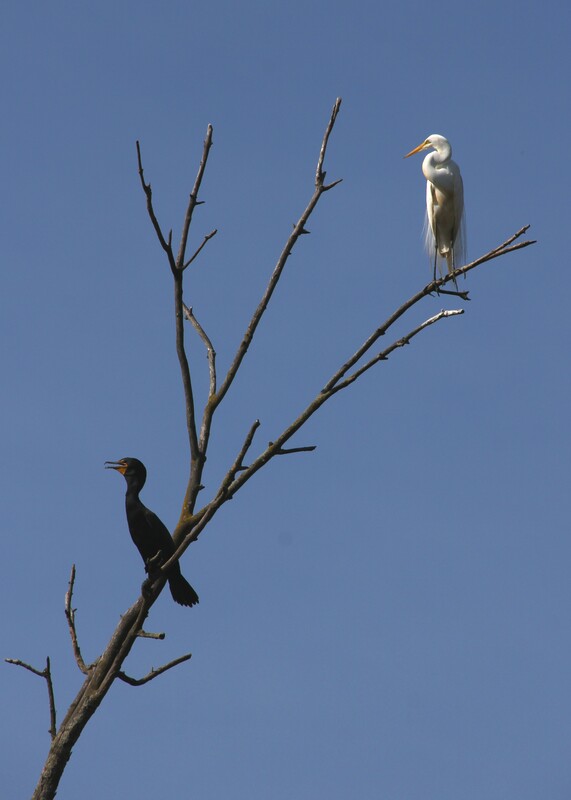 Great Egret and Cormorant north end of Griggs Reservoir, Griggs Reservoir, Canon 60D with Sigma 18-300mm lens, (cropped). 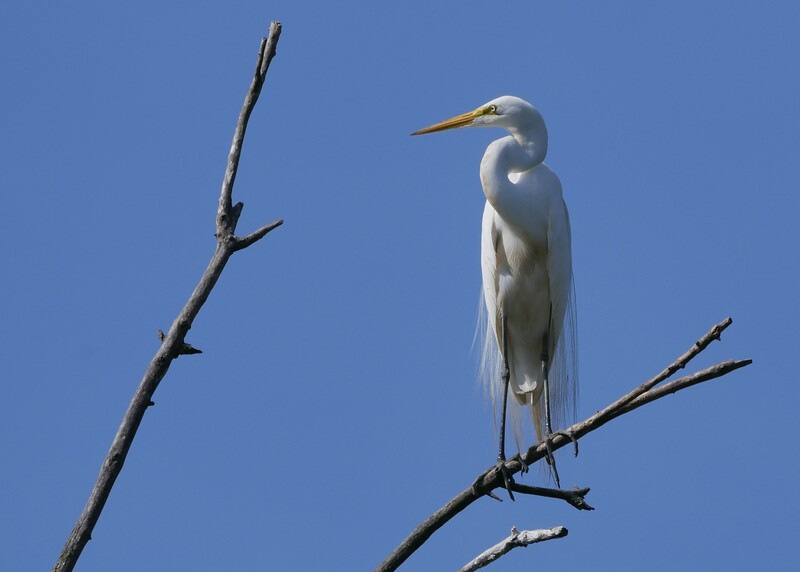 A closer look at the Great Egret, Panasonic G7 Leica 100-400mm lens, cropped, (Donna). 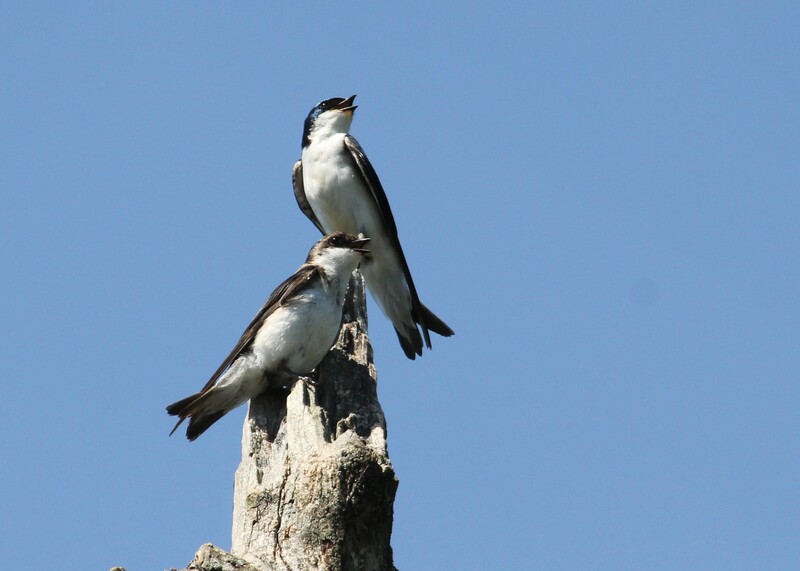 Tree Swallows, Griggs Reservoir, Canon 60D with Sigma 18-300mm lens, cropped. A male Red-winged Blackbird calls out, Panasonic G7 Leica 100-400mm lens, cropped, (Donna). Northern Flicker, Panasonic G7 Leica 100-400mm lens, cropped, (Donna). The below picture is interesting because this Wood Duck duckling, along with three of it’s siblings, was reacting to the presence of our canoe. We never chase birds but these guys shot out of the shoreline brush and took off across the water. Sadly, as we watched them head for another hiding spot, one duckling suddenly disappeared not to be seen again. The victim of a Large Mouth Bass or Snapping Turtle perhaps? Wood Duck duckling, Griggs reservoir, Panasonic G7 Leica 100-400mm lens, (Donna). 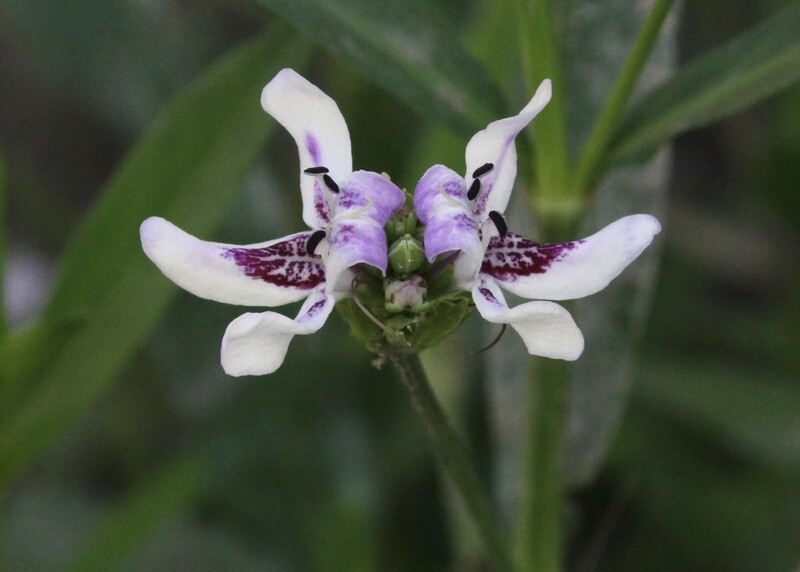 Water Willow, Griggs Reservoir, Canon 60D with Sigma 18-300mm lens, cropped. 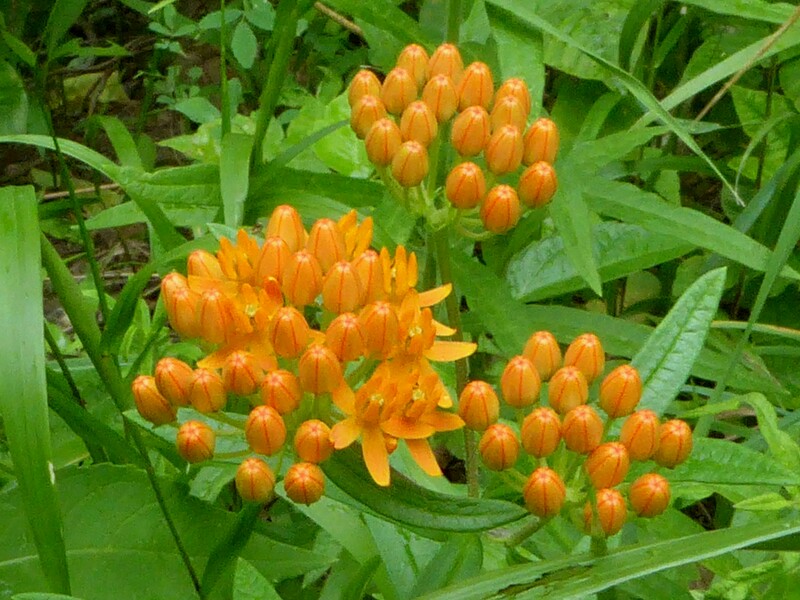 Butterfly Weed continues to make it’s presence known in Griggs Reservoir Park. Along the water’s edge the flowers of the Button Bush have just started to bloom, Griggs Reservoir, Panasonic ZS 50. Looking into the woods, a Day Lily stands out, Griggs Reservoir Park, Panasonic ZS50. Spiderwort, Griggs Reservoir Park, Panasonic ZS50. Moth Mullein, Griggs Reservoir Park, Panasonic ZS50. Wild Rose along Griggs Reservoir, Panasonic G7 Leica 100-400mm lens, (Donna). Trumpet-creeper along Griggs Reservoir, Panasonic G7 Leica 100-400mm lens, (Donna). Black-eyed Susan, Griggs Reservoir Park, Panasonic ZS50. Often we find ourselves enchanted by a new view of something seen before. Such was the case with our close up encounter with the Cliff Swallows. Their nest building and graceful flight, what amazing birds! On the same day the celebration may be interrupted by an occurrence, like the sudden disappearance of a duckling, that is hard to watch. Paddling into Kiwanis Riverway Park, Panasonic FZ200.